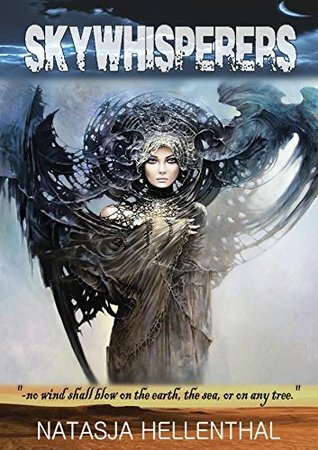 SkyWhisperers by Natasja Hellenthal is really quite an original and unique story. Normally I am not drawn to fantasy type of novels, but when asked to I am more than willing to give one a whirl. I am so glad I did. What an adventure this book turned out to be. Nemsa lives in a barren land, life as she knows it is hard and bleak. The day she was born, the wind suddenly stopped and has not returned since. Life became harder, ecosystems failed and it is a struggle to keep what very little these people have left to continue to succeed. Add into the fact that this young woman is crippled and blind in one eye, being different and blamed for the loss of the wind has caused her to be shunned by the community in which she resides. 25 year old Nemsa has lived her whole life being blamed for taking away how prosperous life used to be. One day out enjoying her solitude, Nemsa is approached by Xenthia. Xenthia reveals herself as a Sky Whisperer, who desperately needs Nemsa’s help. Sky Whisperer, what? Okay, so a Sky Whisperer is an immortal deity that helps the Earth. Xenthia is Sky Whisperer that gets her powers from the moon. There are others that are influenced by the sun, trees, sea . . . you get my drift. So long story short Xenthia needs Nemsa to help save the world. A sickness is spreading across not only the mortal world but also the immortal one as well. Nemsa, is the key to releasing the winds and righting the balance of the world. Nemsa, is a heroic character, who despite growing up shunned and emotionally abused, has a backbone of steel. For all the wrongs she has suffered, she is willingly going to throw herself into harm’s way time and time again to help both the immortals and mortals. She is kind and courageous, strong beyond words, really a fantastic main character. Xenthia is pretty awesome as well, while being immortal and super old, her interactions with the 25 year old Nemsa a delightful. I thought their friendship, and then romance was done very well. There was just enough angst and tension to keep me rapidly reading to find out if they would fall for each other. Once I figured out what was happening in this book, I was hooked. The parallels to protecting our own planet and natural resources were done subtlety, giving you just enough to think about. The main characters as well as the supporting ones were well established and had great dialogue. The plot is original and imaginative and the romance is strong. Hellenthal left the ending with room left for a sequel, and fingers crossed there will be one! This is a really great book to read, Kindle Unlimited subscribers this is a steal for you, this is actually one of the few really good books to choose from. I was given a copy of this book by the author, Natasja Hellenthal, in return for an honest review.